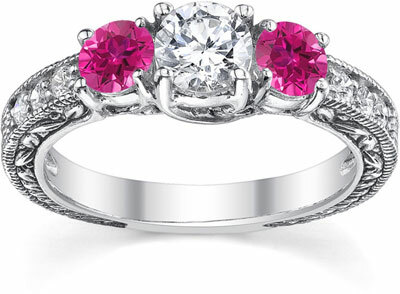 The colors in this pink topaz ring just beam of new love and of a wonderful future together with one's soul mate. The Pink Topaz and Diamond Floret Engagement Ring in 14K White Gold is based on a three-stone design that positively fills the ring with light and energy. The center stone in this ring is a shining white diamond (0.50 carats), which naturally draws in the eye, but it is the stunning pink topaz that keeps the gaze on the ring. Each round-cut pink topaz measures 4mm and simply gleam like the fresh, new colors of a spring bouquet. The 14k white gold band (2.5mm-3.5mm) has a lovely antique quality about it, and features beautiful design work along the sides. The remainder of the band serves as a setting for 6 accent diamonds (0.14 t.c.w.) that bring even more attention to the ring. Becoming engaged is a big moment in life, and it requires a very special ring to mark such a wonderful occasion and to help build the memories of a new life together. We guarantee our Pink Topaz and Diamond Floret Engagement Ring, 14K White Gold to be high quality, authentic jewelry, as described above.